Are You an Injured Worker in Edmonton? Please Join Us on June 28. Are you an injured worker? Do you have something to say about Bill 30? The treatment of injured workers in this province in general? 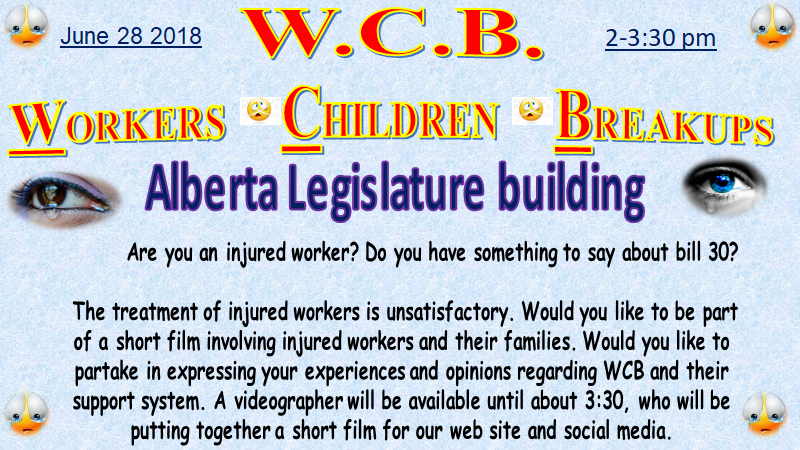 Would you like to be part of a short film of injured workers expressing such opinions? Come to the north steps of the Alberta Legislature at 2 p.m. on Thursday, June 28. A videographer will be available until about 3:30, who will put together a short film for our website and social media. There is also a Facebook event here.